Mallorca (derived from Latin “insula maior” (larger island)), the largest of the Balearic islands, has become a popular holiday destination for tourists from all over the world in recent years. The name of the island has become a synonym for cheap mass tourism since the 1960s. But besides the well-known tourist centres around Palma de Mallorca and at the southern and eastern coast Mallorca also offers many diverse landscapes, excellent sites and perfect conditions for various leisure time sports, an untouched Mediterranean fauna and flora, an unspoilt Mediterranean wildlife and numerous historical sights. Charming little mountain villages, secluded and quiet sandy beaches and bays, peaceful and cozy fishing villages and the bizarre shaped, wild romantic rocky coastline await discovery. These spots can be best explored when you rent a bike or car and go out on your own for the experience of the unknown Mallorca on its coastal roads or wooded, mountainous hiking trails. Due to its geographical richness and its wide range of vacation possibilities Mallorca is an ideal holiday destination for individual vacation, group vacation, couple vacation and family vacation. The Palma de Mallorca region with its long-established tourist infrastracture and the coastline of the adjacent Migjorn and Llevant regions are the main tourist area of Mallorca. The long sandy beaches such as Playa del Palma offer a large variety of leisure time activities such as windsurfing, kitesurfing, sailing, waterskiing, jetskiing, boogieboarding, sea kayaking, scuba diving, surfing and swimming. The beaches may be crowded during high season. Palma de Mallorca, the island´s capital, offers some interesting historical sights, numerous bars, cafes and restaurants, various shopping possibilities and a vibrant nightlife programme. The 16th century Palma Cathedral (“La Seu de Palma” or “La Catedrál de Palma de Mallorca”), a Roman Catholic Cathedral, was built on the former site of an Arab Mosque and impresses the visitor with its French Gothic style. The Almudaina Palace (“Palau de l´Almudaina” or “Palacio de la Almudaina”), a former Muslim fortress built in the 11th century under the Almoravid dynasty, is a spectacular piece of medieval Moorish architecture. It was restored in the 14th century on the order the Catholic Spanish king Jaime II of Aragón as a palace. The northern and western coast of the island is occupied by a long mountain range, the Tramuntana range (“Serra de Tramuntana” or “Sierra de Tramuntana”), which reaches from Andratx to Cap Formentor. The Tramuntana range with its wild romantic and rough mountain scenery, bizarre shaped rocks, pine woods and steep coastline can be best explored on mountainous hiking trails. Its calmness and isolation contrast with the noisy and crowded tourist areas at the southern and eastern coast of Mallorca. It is ideal for lovers of ecotourism and a perfect holiday destination for travellers seeking privacy and calmness. Some charming, picturesque old villages such as Lluc, Pollenca, Alcúdia, Sóller, Alaro, Arta and Deià lie hidden in the Tramuntana mountains, all of which are worth a day trip. Located at the northeastern coast of Mallorca, the city of Alcúdia offers shopping possibilities and other tourist attractions. Its nearby mile-long and sandy beach invites to sunbathing and offers a large variety of water sports activities such as surfing, windsurfing, parasailing, sailing, scuba diving, canoeing, kayaking, kitesurfing, waterskiing, wakeboarding and bathing. Take a stroll through the charming picturesque old town of Alcúdia and visit its weekly markets. The nearby Roman amphitheatre is a worthwile historical monument. The close-by Hidropark (“Parque Acuático”) with its swimming and boating pools, mini-golf courses and giant water slides is a worthwhile day trip destination for families. The nearby S’Albufera National Park (“Parc Natural de S’Albufera” or “Parque Natural de S’Albufera de Mallorca”) with its dunes, salt water marshes, lagoons and lakes fascinates the visitor with its untouched Mediterranean flora and fauna and unspoilt wildlife. It is known among nature lovers for its birdwatching sites. Set high in the mountains near the northern coast of Mallorca between Sóller and Pollenca, the village of Lluc, an medieval place of pilgrimage, awaits discovery. The Monastery of Lluc/ Monastery of Our Lady of Lluc (“Monestir de Nostra Senyora de Lluc”) was founded in 1121 and dedicated to Saint James of Santiago de Compostela (“San Jaime de Compostela”), the patron saint of Spain. Since the Middle Ages millions of Roman-Catholic christians have followed the ancient pilgrim´s trail from Caimari to the Monastery of Lluc to adore the Black Madonna of Lluc (“Virgen de Lluc” or “Nuestra Señora de Lluc”, also called “La Moraneta” by the locals), the patron saint of Mallorca. The monastery was renovated by Antoni Gaudí. Situated at the northern coast of Mallorca, the charming picturesque 13th century town of Pollenca with its historical sights is also a worthwhile day trip destination. You might walk the Way of the Cross (“Via Crucis”) up to Cavalry Mountain (“El Cavalri” or “El Calvario”) and see the Mother of God at the Foot of the Cross (“Mare de Déu del Peu de la Creu” or “Madre de Dios del Pie de la Cruz”), a much-revered virgin statue housed in a chapel on top of the hill. The Plaça Major, the main square of Pollenca, has some good cafes, bars and restaurants and invites the traveller to having a coffee and relaxing after a day´s strolling through the twisted alleys of the medieval town centre. Pollenca also offers a wide range of shopping possibilities and the lively and busy Sunday market at the Plaça Major is also worth visiting. Dominating the Plaça Major, the Church of Our Lady of the Angels (“Esglèsia de Nostra Senyora dels Àngels” or “Iglesia de Nuestra Señora de Los Angeles) built by the Knights Templar in the 13th century impresses the visitor with its austere Baroque façade. visitor with some interesting sights. The Botanical Gardens of Sóller (“Jardí Botànic de Sóller” or “Jardín Botánico de Sóller”) and the Balearic Museum of Natural Sciences (“Museu Balear de Ciènces Naturals” or “Museo Balear de Ciencias Naturales”) invite to exploring the huge bio-diversity of Mallorca and are worthwhile day trip destinations. The Bank of Sóller (“Banc de Sóller”,”Banco Central Hispano” or “antiguo Banco de Sóller”) and the Parish Church of Sant Bartomeu (“Església de Sant Bartomeu” or “Iglesia de Sant Bartomeu”) located at Plaça Constitució, the main square of Sóller, are further spectacular monuments. Founded in 1248 and originally built in Gothic style, the church was renovated in 1904 by Joan Rubió I Bellver, a pupil of Antoni Gaudí, in Art Noveau style. The bank was built in 1889 and designed in Modernist style by Rubió in 1912. The Museum of the Casal de Cultura (“Museu del Casal de Cultura” or “Museo del Casal de Cultura”) is also worth a visit. You might as well make a trip with the Sóller Train (“Ferrocarril de Sóller”) running between Palma de Mallorca and Sóller since 1912 and enjoy the diversity of Mallorcas many different landscapes. A trip with this ancient train is really an unforgettable event and a main tourist attraction. Written by: Markus Mross. 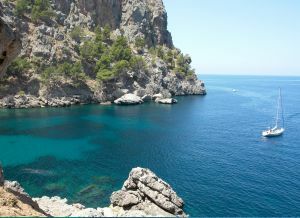 For more information about apartments Mallorca, please visit also http://interdomizil.co.uk/apartment-spain/villa-pollensa.htm.